The Advance is recognised as the best entry level, low-priced, open water swimming wetsuit on the market – designed to provide warmth and help you swim faster and with less effort. The Zone3 Advance wetsuit is recognised as the best entry level suit on the market and Zone3 have worked hard to further improve the look and feel of the suit in their new collection, whilst still keeping the price point as low as possible. As well as providing warmth, the wetsuit is designed to help you swim faster and with less effort. The Advance wetsuit has received much acclaim in the triathlon world with 220 Magazine awarding the suit 92% and its coveted Best Buy award, stating that the Advance wouldn’t feel out of place against many of the midrange products available at twice the price. Tri247.com also tested the wetsuit and stated that the shoulder flexibility felt as good as a top of the range wetsuit from another well-known brand. 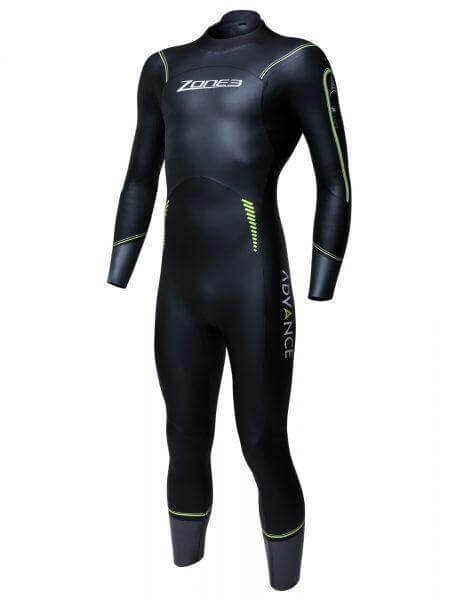 The wetsuit offers the key ingredients which make the Zone3 wetsuit range so popular, but slight changes to the materials and thickness of the product enable the suit to be very competitively priced. Great flexibility around the shoulders and arms for comfortable and energy efficient swimming. Innovative new ‘Extreme Flex’ material used for the underarm panels to significantly improve the distance which can be achieved with each stroke and therefore improve endurance and swim speed. Core support buoyancy panels which are designed to help keep the legs and hips in a higher and more streamlined position, therefore reducing drag and making swimming feel much easier. The use of ‘SpeedFlo’ fabric on 70% of the wetsuit to minimise drag through the water, increase speed and improve durability. The remaining 30% made from high quality rubberised smoothskin neoprene. Zone3’s trademark Silicone coated Pro-Speed CuffsTM on the lower legs to help increase the speed of removal and therefore save time and conserve energy. This wetsuit has a great fit and the low neckline means it is one of the most comfortable entry level wetsuits available. High-quality YKK downwards zipper making the suit easy to take on and off. The thickness is 2mm around the shoulders and underarms, 3mm on the chest and upper back, 4mm on the torso, legs and side panels. 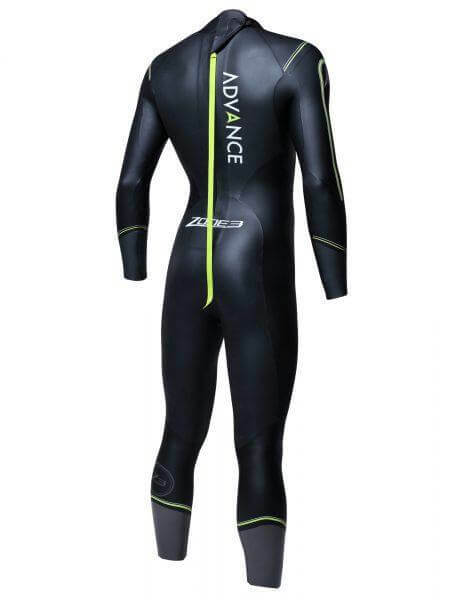 The Advance is the perfect suit for anybody just starting out in open water swimming or triathlon. Alternatively, it is a great training suit if you want to save your best suit for racing. The suit has been designed with all of Zone3’s key features built-in to help ensure that you can have a fast, comfortable and enjoyable swim.